We thought it would be a perfect time to post some information about what to do when an emergency vehicle approaches you on the roadway. There is a lot of information here – please forgive the length of the post. Today we partnered with local Media to also help get the word out. 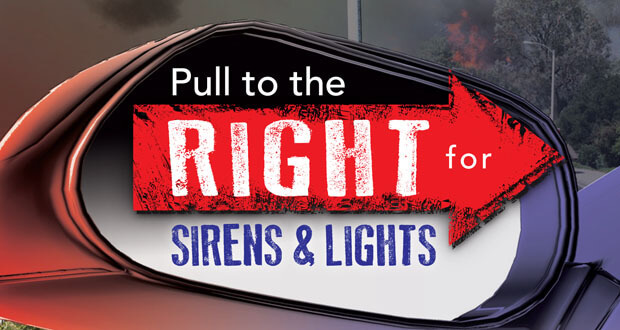 For normal roadways and surface streets: Many use the following national tag line to remember what to do: “Move to the Right For Sirens and Lights”. It really is that simple. We recommend that you slow down, pull right, stop and yield to the emergency vehicle. We’re always looking to pass you on the left. That is our preferred way of overtaking you as we respond to an emergency. Many people panic – we know that, we expect that. Our trucks are big, they’re bright and they’re LOUD. Don’t worry, remember the rule of moving right and we’ll figure it out from there. When we approach you from behind while you are stopped at an intersection, stay where you are unless you can pull safely to the right. We do not want you to drive through a red light. Don’t panic, we’ll figure it out from there – sometimes we’ll end up going the wrong way through an intersection so you’re not forced out into an unsafe intersection. For high speed roadways and Interstates: Unfortunately, it’s not as simple or easy on the interstate, especially in heavy traffic. First, for a free flowing, high speed roadway (an interstate with no traffic) we still want to pass you on the left, please slow down and pull right so we can pass. We do not go as fast as you (our trucks are big and have speed limiters on them). If you’re traveling on a high-speed road or if there is no room to stop (such as in a construction zone) slow down as much as possible, move right and let us pass. Now, here is where it gets tricky. If the road has heavy, stopped traffic, it may not be possible for us to get all the way over to the left lane. We may decide to ‘split’ the left and right lanes, with drivers moving over left and right as we drive up the center. We may also choose to use the right shoulder (the emergency lane). In this case the “Move to the Right For Sirens and Lights” may not work. For the interstate scenarios we ask that you take a cue from the responding vehicles and ask yourself – where are they? What is everyone else doing? Mirror the others, don’t be that one car that does the opposite and ends up blocking us. • Never drive with head phones on. We see this every day, they’re usually the one vehicle that doesn’t yield to us and has no idea we’re behind them – because they can’t hear us. • Never race an emergency vehicle, it risks your safety and if you crash, we have to stop to help you and the person or situation we were responding to will receive delayed help. • Never use the emergency lane as a normal lane of travel. Please leave that lane open for us to use to bring additional help. Its ok to move over to the lane briefly to allow something to pass, but you should NEVER be using that lane to pass other vehicles that are stuck in traffic. • Don’t panic and freeze, please stay calm – we’ll be past you and on our way quickly. • Do not follow a responding emergency vehicle just so you can get through traffic, we see you back there and you may even be on video! It’s not always a cut and dry scenario, as depicted above, and many things can occur that will throw a wrench in the plan (construction barriers, large vehicles, concrete medians, soft shoulders, trains, school busses etc) but rest assured we’ll figure out a way to get past you safely. All of our drivers are certified Emergency Vehicle Drivers (EVD).